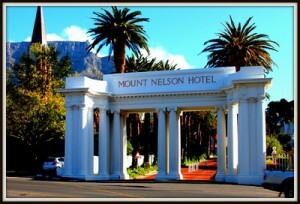 The population of Cape Town number 33,239, while there are about 12,000 people living in the surrounding districts. During the first half of the nineteenth century wool was unquestionably the Cape’s principal export. In late 1870’s, Phylloxera that almost wipe out wine production, brake out in the vineyards of the Western Cape. To aggravate matters, the Colony suffers a severe drought. Late Victorian Cape Town smelt quite unequivocally of the sea and fish. The ocean, with its ever increasing traffic and its rich harvest, provided more than a poetic flavour to life in the Mother City. By the time dawn lit the sky, the fishing fleet was well under way into the Bay Its return was eagerly awaited on the beach by, brightly garbed fishwives, hawkers with their pagoda-shaped hats and bamboo yokes, perhaps a turbaned imam or two, and dealers with their fish carts and horns.Fish were kept alive in tanks near the whitewashed block of a fish market. Others were cleaned and either curried or smoked on the beach under the close and noisy scrutiny of a cloud of squabbling gulls, greedy for offal. Hawkers and dealers roamed the city and the suburbs announcing their wares with the nasal cry of the fish horn. These unmusical instruments were originally no more than lengths of dry hollow kelp stems, but more affluent hawkers had permanent horns made from tin. There was hardly a European country not represented at the Cape. During the border wars with the black people, black prisoners had been brought to Cape Town and sometimes men, women and children were transported in reprisal raids. Some black people actually walked to the Cape in search of relatives who had been taken there. 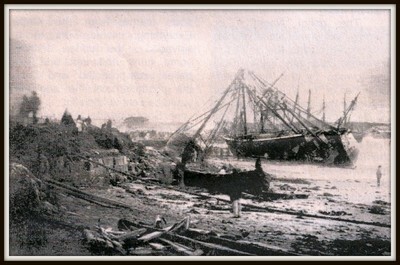 Between November 1879 and May 1882, 2400 men were imported from Delagoa Bay on three-year contracts. Less than half of them returned home. By the beginning of 1881 some had deserted for the open wage market and were living with blacks from the Eastern Cape in the outbuildings of the old police station at Altona, Papendorp, as well as in a stable in Roodebloem and wherever else they could find a corner to creep into. In September that year a regular free fight developed when about 200 blacks from ‘locations’ in the vicinity of Papendorp rose in a body and were attacked by a mob of whites and ‘coloureds’ who proceeded to destroy the Black people’s property. This once again roused public debate on the provision of a supervised black location – something which had been discussed since the 1850’s. In 1875 the population of Cape Town numbered 33,239 while there were some 12,000 people living in the surrounding districts. 1875 August 1875The Reverend S. J. du Toit forms Die Genootskap van Regte Afrikaaners, a body which aimed at making Afrikaans the literary language of the Dutch section of the population. Jan Hendrik Hofmeyr became the head of the Afrikaner Bond and editor of “Ons Land” (Our Land). He collaborated closely with Cecil Rhodes before the Jameson Raid. It was due largely to the efforts of the Afrikaner Bond that Dutch was recognised as the second official language of the Colony in 1882. He assisted with the drafting of the South African constitution and served as a member of the delegation, which took this draft to London. He died there in 1909. 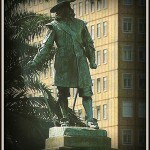 The Jan Hendrik Hofmeyer statuestands in Church Square, behind the Groote Kerk. He was affectionately called “Onze Jan” (Our Jan). It was sculptured by Anton van Wouw. 1879 12 November, The Metropolitan Methodist Church is opened. Built under the supervision of Charles Freeman (architect) and TIC Ingelesby (builder) in 1878/79 at a cost of £17700. The church was attended by many prominent citizens of Cape Town and was famous for its fine preachers and outstanding choirs. The Rev. Ernest Titcomb conducted the first radio broadcast of a church service in South Africa from the Metropolitan Church in 1928 and large crowds gathered to hear his fine preaching. Metro (as it was affectionately called) continued to attract large congregations until the 1960s when urban sprawl and other factors began to take their toll and attendance and membership declined. By the late 1980s only a few dozen people attended services. 1879 Construction of the new Houses Parliament start. 1880 Cape Town is linked to Europe by overseas cable. 1880 The steamship Trojan, the first vessel to be illuminated by electricity arrives in Table Bay. The crowds flock to see her. 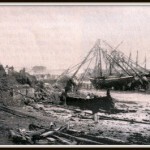 1882 Twenty electric lights are installed in the Docks. A similar installation is done at the Cape Town railway station. 1883 A large wine store is purchased on the corner of Buitenkant and Albertus Streets and converted into a place of worship for the congregation. The Buitenkant Street Methodist Church (as it was known) served the people of District Six and was a thriving congregation until District Six was declared a White Group Area in 1966. Today it houses the District Six Museum. 1884 A local telephone service, with fifty subscribers, is started. These services were an important aid to commerce, particularly at the Docks where the breakwater, two basins and a dry-dock had been completed. 1884, The new Houses of Parliament are completed. Opened during the following year by the Governor, Sir Hercules Robinson, they had cost some £220,000, just on four times the original estimate. 1885 The new Houses of Parliament are equipped with an electric light plant. 1885 Many miles of hard roads as well as a number of bridges and mountain passes had been constructed by the Colonial Government. 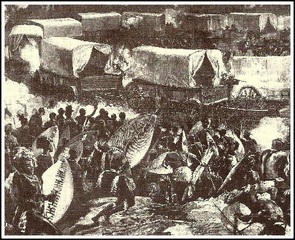 Railways from Cape Town, Port Elizabeth and East London were being pushed further across the Karoo in the direction of Kimberley and the Orange Free State. The telegraph was speeding up communications between the major centres of the Colony, whose exports had been increased considerably by diamonds, wool, copper and ostrich feathers. The first Cape Town to Kimberley railway line is completed. 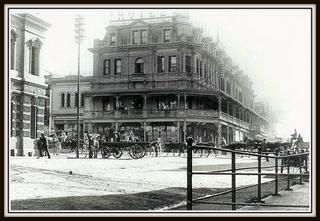 1885 Construction of the Grand Hotel, on the corners of Adderley, Strand and St George’s Streets start. It was, designed by Charles Freeman. The interior was considered a marvel of luxury; on entering from Strand Street the mosaic floor was emblazoned with the arms of the Cape Colony. It was demolished in the 1950’s. The façade of the old hotel was rebuilt, to the old specifications as the Grand Hotel, anchoring the Grand West Casino complex in Goodwood. 1886 The Molteno Reservoir is completed. The first contract for the construction of the Molteno Reservoir, to supply water to the City, had been signed in 1877, but before the work was completed a wall collapsed and streets and houses in the vicinity were flooded. The damage, however, was repaired. Is has a capacity of forty-one million gallons. 1887 The granite pedestal, of the Queen Victoria statue, is laid by the Governer, Sir Hercules Robinson, in the grounds of the Houses of Parliament. It was erected by Public subscription in honour of her Golden Jubilee. T. Brock, A.R.A, executed the Statue in Italian marble. The statue was unveiled 3 years later by the Governor, Sir Henry Loch. 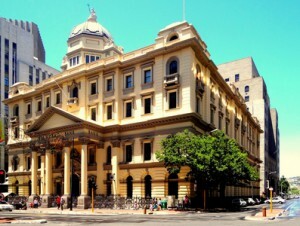 1889 Plans are completed for the construction of the Standard Bank building Adderley Street. A local contractor, T. J. C. Inglesby, completed the building at a cost of £27,000. 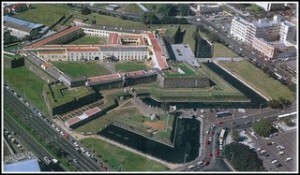 The City Council offered the site on a ninety-nine year lease at £150 per annum, to the Bank. Charles Freeman designed it in the neo-classic style that was favoured so widely by the Victorians. 1889 A start is made on the construction of the City Hospital, adjoining the New Somerset Hospital, in Portswood Road. The former institution, completed in 1902, was erected for the isolation and treatment of patients suffering infectious diseases. 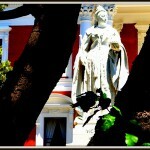 1890 Cecil John Rhodes becomes Prime Minister of the Cape. 1890’s About 1400 Mfengu from the Eastern Cape are contracted to work for the Harbour Board. By 1893 a few of these men had brought their wives and families to town and it was hoped they would settle here and become the foundations of a black working class. Besides the Mfengu and Xhosa, new arrivals in the 1890’s included 1900 Tswana captured during the Langeberg rebellion of 1896-97 and transported to the Cape for indenture. By the turn of the century the black population of the Cape was too sizeable and too permanent to be simply assimilated. Talk of a separate location became more serious but it was not until the bubonic plague outbreak of 1901 that black people, always a convenient scapegoat when unsanitary conditions were discussed, were finally forced to relocate themselves at Uitvlugt (Ndabeni) on the Cape Flats. Up to the end of the 1880’s the streets of Cape Town were still unpaved. The municipality embarked on an extensive street-paving programme, between 1890 and 1909. 1891 Rudyard Kipling arrives at the Cape. In 1998 he becomes a good friend of Cecil John Rhodes. 1892 19 February, The cornerstone of the Tafelberg Dutch Reformed Church (Cnr Buitenkant and Commercial Streets) is laid. The inauguration of the Mission Hall, as the building was then known, was held on 27 January 1893 This predominantly late Victorian church complex is situated on property purchased by Susanna Hertzog, who donated it to the Nieuwe Kerk in a trust deed later in 1893 The complex consists of the church, Cornelia House and the William Frederick school building, all designed by GM Alexander. 1892 The railway line between Cape Town and Johannesburg is completed. 1893 The Commercial Exchange building is demolished, to make way for the General Post Office building. For seventy-one years it had contained the town’s largest hall, which had been the scene of many historic gatherings and functions. 1893 The old Opera House is opened. 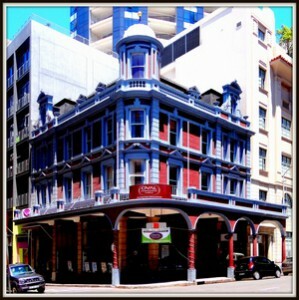 It stood on the corner of Darling & Parliament Street. Its first production was a performance of Dorothy given by the Lyric Opera Company. 1895 The Metropole Hotel, cnr Long & Castle Streets opens its doors. It is now called ‘The Grand Daddy’ hotel. 1895 Water-borne sewerage is introduced. It was planned with a sea outfall at Green Point. A great deal of the pipe installation, still in use today, was laid in tunnels that were hewn through rock. 1895 Cecil John Rhodes is forced to resign as Prime Minister, as a result of Leander Starr Jameson,s failed raid in the Transvaal. 1886 Mark Twain visits Cape Town. 1896 The private company, who runs the horse, drawn trams and omnibuses between the town and the municipalities of Green Point and Sea Point, and Wynberg, embark on a programme of replacing its old transport with electric trams. By the following year there were thirty-two of these vehicles in service and in 1898 the company was registered as the Cape Electric Tramways Limited. Ten massive, noisy double-deckers were imported from the United States. 1897 The opening of the General Post Office building. It has since made way for the Grand Parade Centre. 1897 The City Club, in Queen Victoria Street, is built. It was designed by Herbert Baker and Francis Masey, in the pictorial, late 19th century manner, which was fashionable in London when Baker was working there. 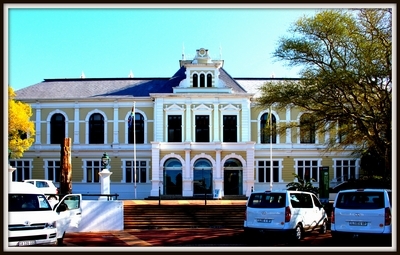 1897 The South African Museum is built. Situated at 25 Queen Victoria Street, on part of the Company Gardens, it is the oldest museum in the country. The museum was founded in 1825 with Andrew Smith as its first director. It was designed by the Dutch-born Transvaal architect, J. E. Vixseboxse. 1897 Sir Herbert Baker and Francis Massey design a new Gothic cathedral to form part of the existing St. George’s Cathedral. The 13th Century French Gothic Style Cathedral was built of Table Mountain sandstone, quarried from Platteklip Gorge. 1901, The Duke of Cornwall and York lay the foundation stone. (later King George V). 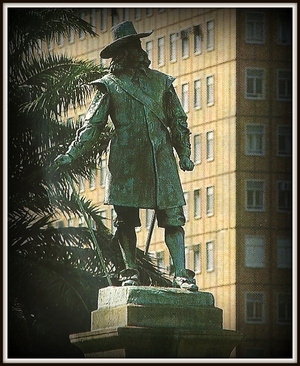 1899 The statue of Jan van Riebeeck, is erected on the seaside of the fountain in Adderley Street. The Sculptor was John Tweed, a Londoner, and a pupil of Rodin. It was a gift from Cecil John Rhodes, to the Nation. The name of the Railway station opposite was then changed from Green Point, to Monument Station. This station served the railway line to the Docks, and Sea Point. 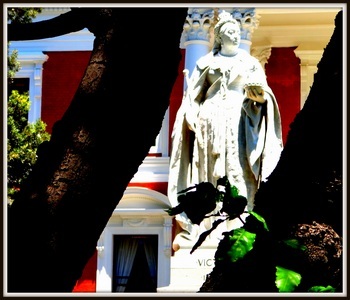 His wife Maria de la Quellerie’s statue is next to that of Jan van Riebeeck. It was unveiled by Prince Bernhardt of the Netherlands in 1954 and was a gift from the Netherlands Government. 1899 4 March The Mount Nelson Hotel opens its doors. Situated at the top of Government Avenue. It is one of the few end-of-the-century hotels still in use. It was originally a private house, owned by the Ross family, built largely of material brought out to the Cape as ballast. 1899 24 August, The foundation stone of the Huguenot Memorial Building at 48 Queen Victoria Street is laid. 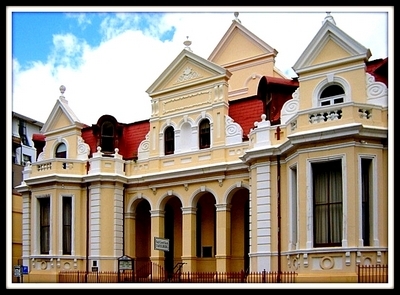 This predominantly Edwardian building was erected by the Synod of the Dutch Reformed Church to commemorate the arrival of the French Huguenots (1688). The building was officially opened on 15 October 1903. 1899 11th October, The Anglo Boer War breaks out. The Cape Town economy benefits by the arrival of ships bringing troops, supplies and arms. 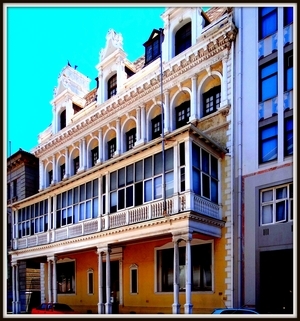 1900 The Cape Heritage House, cnr Church and Burg Streets, is designed architect E Seeliger, for the jeweller I Mendelsohn. It was originally known as Mendelsohn’s Building.